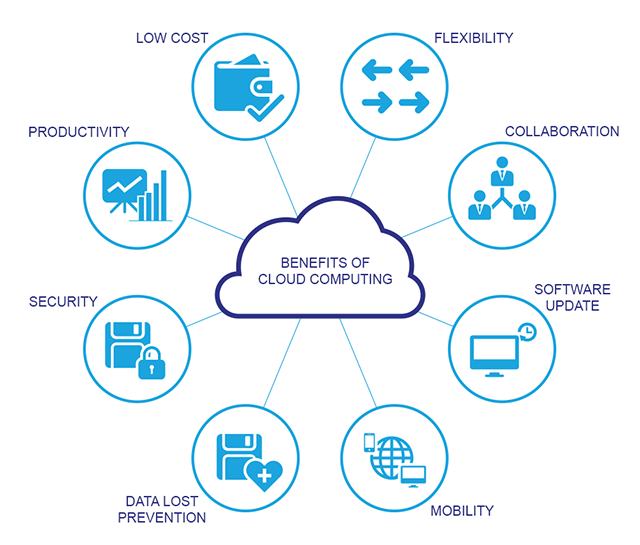 Understanding of cloud computing within the general business community has been an evolutionary process; however, the picture of what it is, how it works, and what it means has become crystal clear. Increasingly, cloud technology is being seen as an essential tool for turning change from a threat into an opportunity. When IT resources are focused on maintaining existing infrastructure and on-premises solutions, they are unavoidably stuck in a defensive operational mode—just keeping things up and running is an overwhelming effort. Cloud-based solutions help drive a fundamental shift in IT, from system deployment and operations to technology business partner. It’s also possible to take advantage of new, innovative functionality more quickly and cost-effectively than was historically possible. If an initiative succeeds, it can be scaled seamlessly to a wider audience. If it fails, the project can be shut down quickly. To do their jobs better, faster, and more flexibly, workers have turned increasingly to “shadow systems” outside of officially sanctioned core IT applications. Personal mobile devices are used to tap into the company network. Teams use personal file-sharing accounts and project management tools to work on projects together. In short, workers are implementing their own cloud-based solutions to achieve the ease of use and functionality they need but aren’t getting from their own IT departments. How can cloud help? With the right cloud-based applications, organisations can help employees to do their jobs better, faster, smarter, and more collaboratively. Cloud-based solutions allow businesses to rapidly establish a new presence or expand existing operations in virtually any region without having to physically be there, which substantially minimises both capital investments and risk. They also offer better business outcomes by allowing remote offices to operate seamlessly alongside other business units and headquarters, and make it easier to share information regardless of partner or supplier location. Keeping aligned with continuous changes in software, security, and regulations is typically complex, manual, and expensive. This is an area where cloud-based solutions offer extraordinary benefits to businesses eager to increase productivity and reduce risk. In a cloud-based SaaS world, security and compliance updates can be pushed out automatically to the entire organisation as soon as they’re available. The approach also offers huge value for firms operating in multiple countries, which can make regulatory and compliance challenges even more complex and costly. According to Dun & Bradstreet, 59% of Fortune 500 companies experience a minimum of 1.6 hours of downtime per week. That translates to more than 70 hours a year, at a cost of more than $46 million per year in lost labour alone. In today’s economy, downtime means lost revenue. Companies can’t afford to have their critical applications offline. The right cloud computing solution is available 24x7x365, no matter where employees are located or what devices they’re using. Because cloud computing providers deploy equipment that is typically far more reliable than anything most companies would use for their own on-premise solutions, they can achieve system up-time levels that are difficult to match.